When the automobile was invented, there were plenty of people who laughed at the idea and called it horribly dangerous. They may have been right, but cars have managed to become pretty popular anyway – so maybe we should be a little open-minded when it comes to other brand-new forms of transportation. This electric multicopter is the first of its kind and is getting a lot of ribbing from people who think it’s crazily dangerous, but what do they know? This could very well be the way we all commute to work in the future. 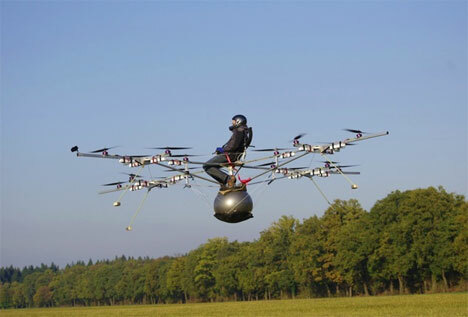 The video above depicts the world’s first manned flight of an electric multicopter. It’s got 16 rotors and a mere $8 worth of electricity can keep it going for around an hour. The rider uses a joystick to steer while the computer “brain” regulates the level of the craft and most of the other functions. Although it looks kind of freaky (the pilot is steering this thing while perched atop a yoga ball, after all) there are plenty of safety features built in. The multicopter can still land safely even if up to four of the motors die in flight – and since there’s no top structure above the pilot, he can release his seat belt and parachute to the ground if there’s ever a serious problem. See more in Mods & Custom or under Transportation. November, 2011.